Employees at Roseburg Forest Product’s Riddle plywood plant program a machine at the mill. 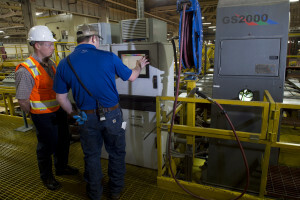 Engineers and millwrights often use technology in sawmills that requires workers who are highly skilled and trained, but not necessarily college graduates. Roseburg Forest Products didn’t survive the Great Recession by ignoring the need to change with the times. As social, political and economic forces reshaped the timber industry in recent decades, company leaders looked ahead and tried to prepare for an evolving market. One sign of that has been the recognition that the organization would need to grow its own workforce, according to Kellye Wise, vice president of human resources and labor. Wise said although there is a segment of the Douglas County population that expects its high school graduates will pursue four-year degrees at colleges and universities, many lack the orientation, tools or desire to travel that route. And what many families may not realize is that Roseburg Forest Products has a wide scope of opportunities for area youth. 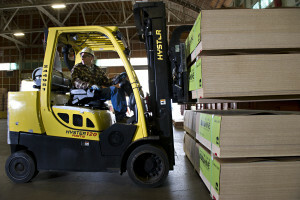 A forklift operator prepares to move material to be shipped as he works at the Dillard-based composites facility at Roseburg Forest Products. It’s true that certain positions do require college graduates. But Wise said there are many jobs with good living wages open to students who are open to attending trade schools, either in advance of applying to Roseburg Forest Products or on the side while working on the job. 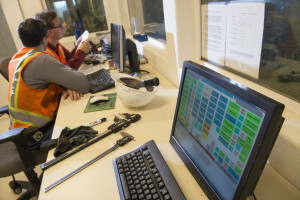 As plant operations become more automated, technological skills are more in demand. A machine operator may be sitting before a bank of computers and will need to be savvy in understanding the required programs. Yet Wise said technical skills are also very much in demand, as electrical engineers, millwrights, drivers and other workers go about their jobs with a more direct, hands-on approach. To fill these positions, “we’re reaching out more as a company to schools, inviting high school metal shop classes to visit, or robotics teams from junior and senior high schools,” Wise said. “We have opportunities for the kids who want to get a GED or a high school diploma and then start working, we have jobs for the kids who want to get a technical certificate or go to Umpqua Community College and into an apprenticeship program. The company has found other ways to attract and keep good employees. Its Maintenance Upgrade Program offers to pay the cost of skilled apprenticeship programs at UCC for qualified applicants. In addition, the company will pay a “bounty” to millwrights and electricians who refer job candidates who are hired and remain employed a certain amount of time. Wise said Douglas County students who are interested in joining an 80-year-old family-owned company that’s diversified, green and committed to sustainability – characteristics that point to a solid future – can spruce up their applicant credentials by taking courses in math, focusing on communication skills and exhibiting a strong work ethic. Because many of the jobs are physical, fitness is a plus as well. Banks of computers have taken the place of earlier, less sophisticated labor systems at Roseburg Forest Products plants across the nation, making skilled computer technicians in demand. Available positions at Roseburg Forest Products can be viewed at roseburg.applicantpool.com/jobs. According to the Oregon Employment Department’s occupation and wage information tables, careers related to the timber industry offer “reasonable employment opportunities,” with growth projected to be faster than the statewide average through 2022 for sawing machine setters, operators and tenders (average annual wage in Douglas County: $38,000). The same was true for logging equipment operators (Douglas County wage: $42,600). For machine feeders and offbearers, growth was expected to be slower but the total number of job openings was projected to be higher than the state average (Douglas County wage: $33,000). Photos courtesy of Roseburg Forest Products. Learn more about this company on its website www.roseburg.com.